We almost did not go. Adam (the Vuda Marina Manager) had some reservations about the trip. We had checked with him the week prior and he was enthusiastic; but now, as the time was upon us he began to waffle. We hope to leave tomorrow. He said he would still think about it. W/ was acting cruiser coordinator. Six cruisers had committed to this and 5 already paid but we still didn’t have a final word. That evening 5 of us hung together during Happy Hour at the Boatshed and Adam was there. We thought if there was any issue he would stop by and let us know. The last thing W/ wanted to do was go knocking on boats the night before and say “it’s off”. By the time Happy Hour was over Adam had not spoken with us. We thought we were in the clear. 30 minutes later Simon came a knocking on our boat and said Adam wanted to talk to W/. Damn! W/ went to met Adam for a late con fab. Returning to the boat later she was relieved and said the trip was still on. Simon is still our tour guide; but, as an independent agent and not as a representative of the marina. Ok… Whew! No late night bad news for anyone! At 8 am all of us were waiting for the van by the office. Simon, Niki, and Maria arrived all carrying coolers of food, drinks, and snacks. I was still leery and wouldn’t yet swear we were going until we made the first turn out of the marina. The van arrived and we loaded up, ready to go. I held my breath and we began to move. A couple of minutes later we made the first turn. Breathe in… Breathe out… Breathe in.. Breathe out! We are going. 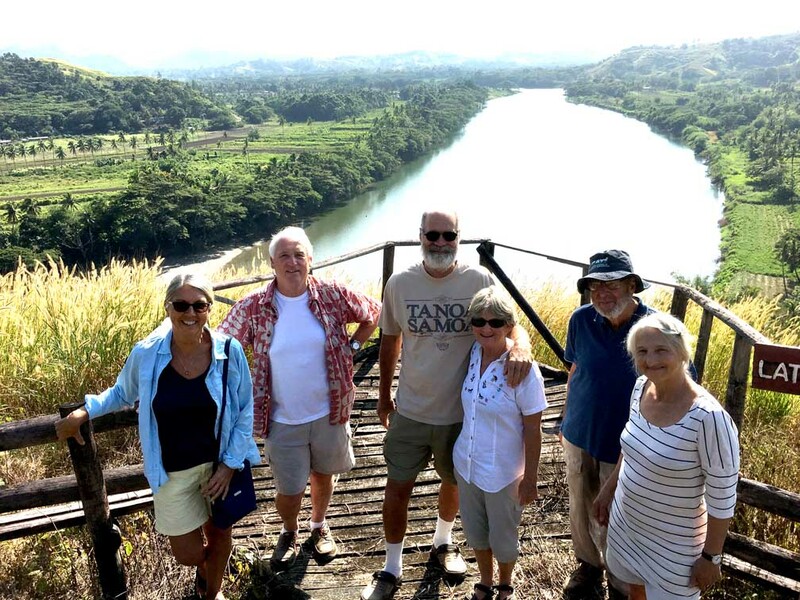 Our itinerary was a rather ambitious one: Sand Dunes, two waterfalls, a swim on a notorious Fijian beach, shopping in Fiji’s capitol of Suva, the museum, tour through Fiji’s Salad Bowl farming area, and an evening in Simon’s village of Laselase. We knew everything would be too much to do in two days. Alas, we are cruisers and plans are made to be changed. No one in our group had any issues with changes. from the the rich clay in the river valley. Greg; our cruising potter found some shards and we ooo’ed and awww’ed over his descriptions of the firing and quality of the pieces. There are so many pottery shards there Simon had no issue with Greg keeping a piece as a souvenir. 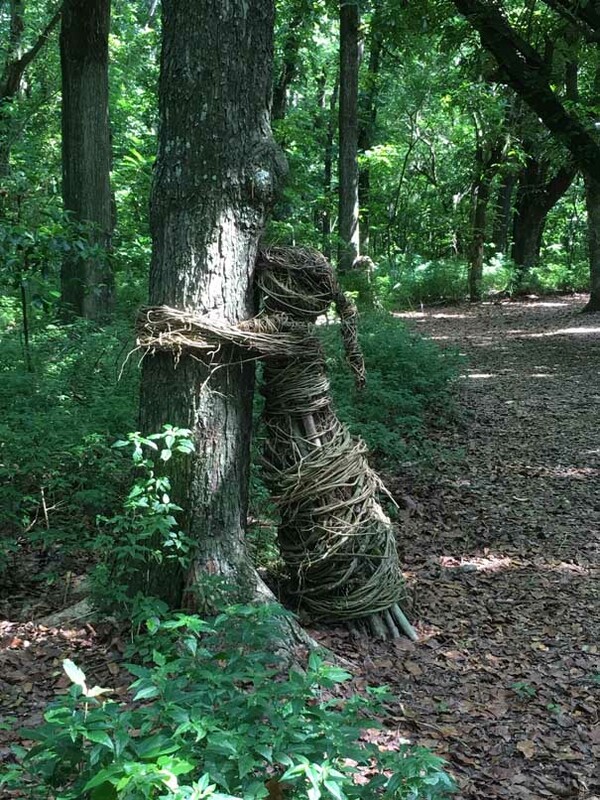 these human formed tree hugging sculptures. Everyone loved the huggers. A short distance beyond we returned and Simon; our tour guide, had cold drinks for us. A brief rest and we were again on our way. up. The shoe soles survived; he didn’t. The shoes are now in the Museum which was our next stop, or so I thought. We swung by the President’s residence for a brief visit and while he never made time for us we spent a few short minutes annoying the guard. He was as well trained as anywhere else in the world and never even flinched as we “checked him out” and shot a few photos. Albert wanted his picture taken too so we snapped it. Albert is the town “Head Man” for Simon’s village; Laselase, and we picked him up on the way into Suva for more local lore as well as some extra laughs. 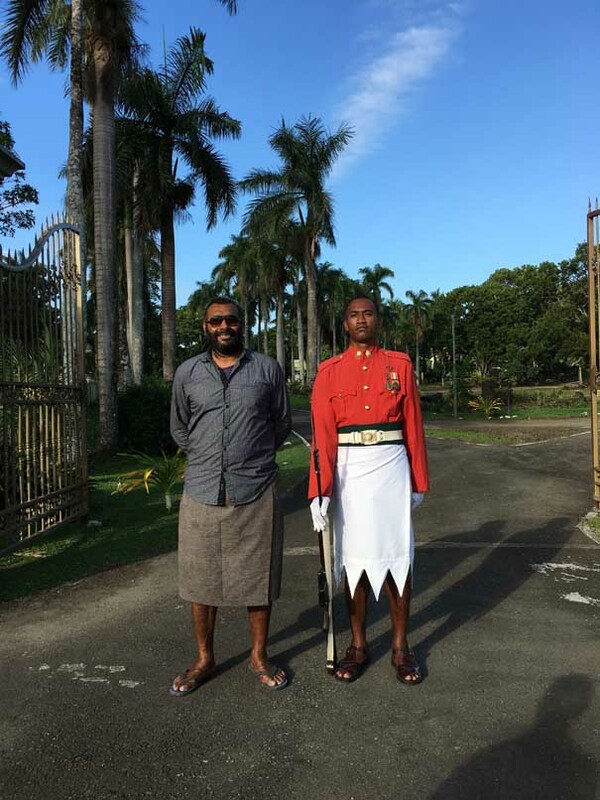 He has a deep throated voice and a conviction of the Fiji history that boarders on the absolute. We listened to his stories, asked a few questions and laughed a lot. The museum’s exhibits were quite eye opening ranging from the islands natural history to the Fijian cultural history interspersed with art and archeological finds. We found the exhibit which included Bakers shoes but the lighting there was not the best. None of us could identify teeth marks. 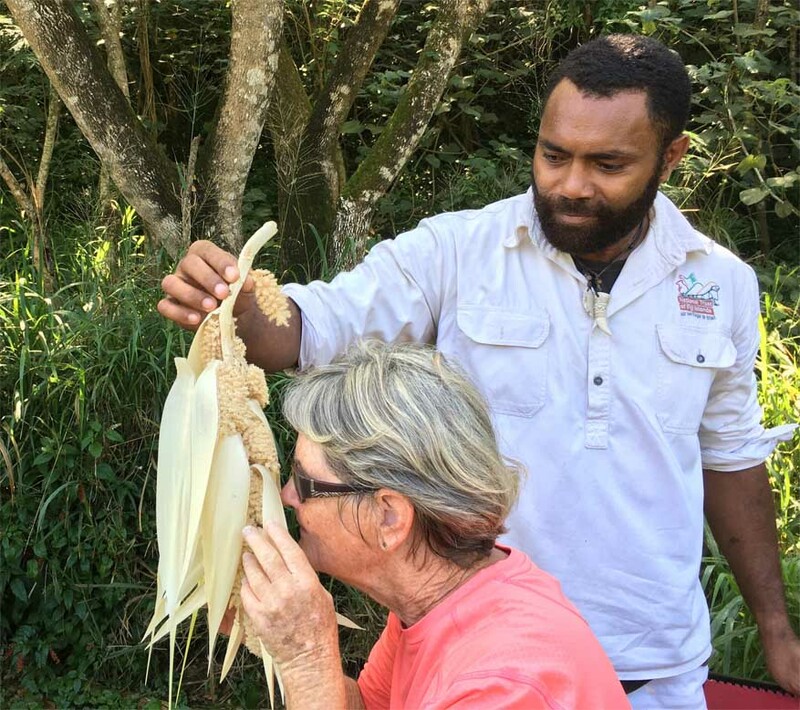 After we closed up the museum we loaded into the van and headed back to Laselase where we were to have a lovo created dinner, a Kava ceremony, and discover our accommodations for the evening. Our accommodations were at Simon’s Uncle’s home. Our room for dinner and the Kava ceremony is more like what we might call a Great Room. More of the local history / family history was talked about while waiting to eat. Family members came and went, never knocking, but announcing their entrance much as I remember it in my neighborhood growing up. Mom would peek in the neighbors door and say “Hello” as she walked into the neighbors house looking for a response so as to know which way to go. That evening we met close to 40 people whose names I have no recollection of. All I can say is everyone was most welcoming and wanting to exchange information between our two cultures. Fiji time; an hour or two later we began our lovo Dinner. All of it was prepared in a pit of super hot rocks covered with banana leaves, and topped with piece of corrugated Tin and earth. The food was all prepared to perfection; nothing burned, and no one ended up hungry. There were a couple of types of fish, Chicken, Breadfruit, and salad. After the meal the men gathered in the Great Room and one of the elder teens brought a beautifully crafted bowl of hot water and a bag of finely cut Kava. He dipped and squeezed, dipped and squeezed several times tasting every so often to make the mixture just… right. After the mixture was perfect Albert gave what appeared to be a standard Fiji welcome and described how the circular bowl shared by all in the group brought us to a common place – all as family. The cup, dipped in the peppery liquid was then dipped and passed, dipped and passed to each member in the room. 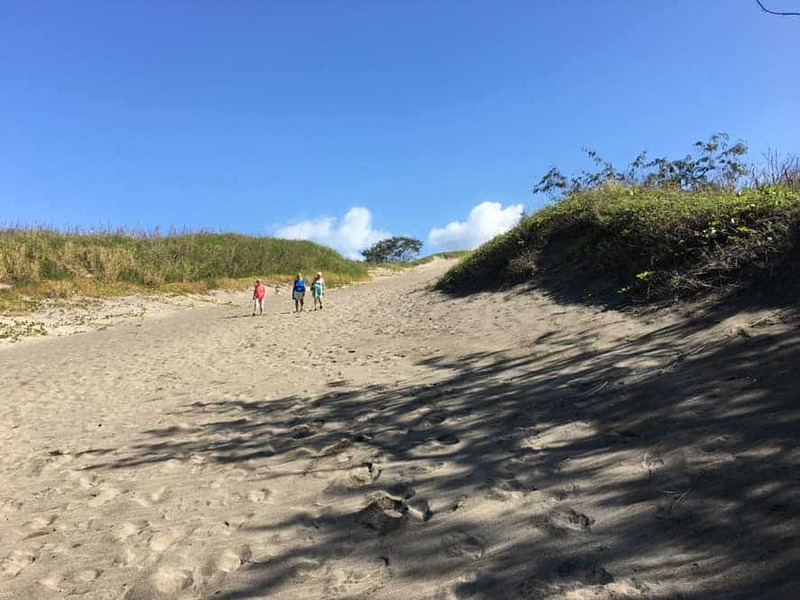 While one could refuse to drink the Kava and from what they indicated it would be ok – none did; however as outsiders we were offered three different amounts in the coconut cup; high tide – a full cup, medium tide – half full cup, and low tide – just a wee bit in the bottom of the cup. John being the eldest of the group; thankfully no one ever asked our ages, was offered the second coconut cup. Albert was the first to imbibe. John having done a few ceremonies before chose High Tide and thus set the president for the males in our cruiser group. There is a clapping ritual that goes with the drink and maybe W/ will chime in here when she edits my post. (3 claps, followed by 2 and ending with three more claps) Everyone had some and because there was a great deal left the cup went around again. W/ this time abstained and I had one more medium tide and finally a low tide. The peppery drink is said to effect our emotional state creating a slightly euphoric feeling; but for me, mostly what I felt was a burning on the lips and a bitter, bitter taste in the mouth. Practically speaking I felt I was drinking warm dirty river water although in my years swimming rivers, and lakes I’ve never gotten a mouthful of warm water. As the evening progressed and stories told, questions asked and answered we were assigned our sleeping quarters. As already mentioned they shared their home with us. W/ and I were lucky – I have no idea why but we received a mattress on the floor of one of the children’s rooms in which the only light was a blue bulb! It had to be a teenager’s room. Greg and Danielle had a room next door to ours with a single bed. But John – the eldest, was given the bed and Greg and Danielle had the floor. The ceilings were not attached to the roof so everything said in one room was clearly understood in the next and with all 5 of us sleeping in close quarters snoring became our white noise. The doors were framed with patterned sheets. Christina was given the great room and luckily she had more experience with the expected accommodations and had brought a backpack mattress and sleeping bag. Albert, Simon and the other men moved to the kitchen to enjoy more Kava. There they stayed up well past midnight sharing tales and adventures with each other. By the am having slept at least 4 hours I was seeing light in the outside sky so I decided to take a shower. Often in tropical climes showers are not heated and here was no exception. I was completely awake by the time I finished and upon return to our room W/ was stirring . Soon the entire group was up and discussing last evenings events and experiences. Before breakfast we had a tour of Simon’s village and everyone knew Simon, knew we were there and welcomed us all. The experience reminded me of small town America. Back at Simon’s uncle’s we had Fijian pancakes, a folded over donut is the best way to describe it, bananas and lemon tea. I opted for water. At 7 am our driver Joe was to arrive and already it was getting on to 9am when he appeared. Fiji time is about the same as latin time or as I like to call it … elastic time. 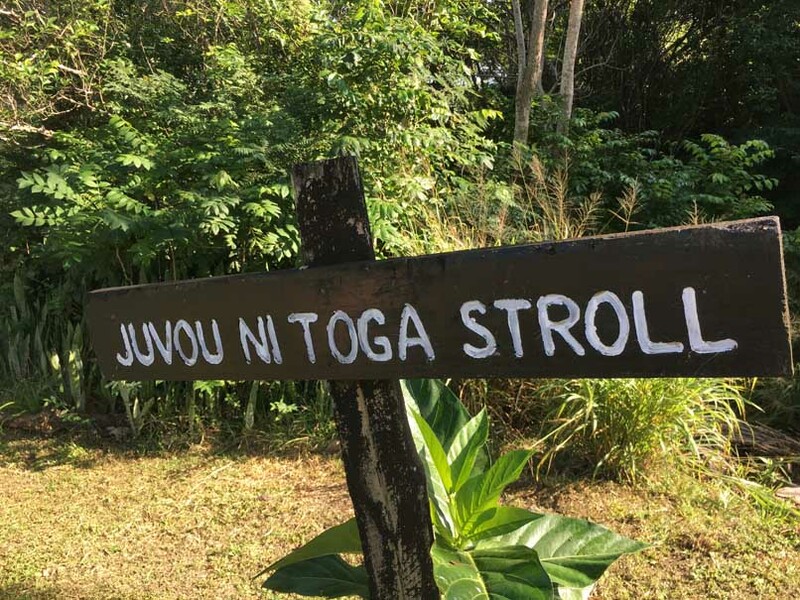 Siga Na liga – Fijian for “No Worries”. We hear that phrase often in Fiji. First on the days adventure was to visit a Tongan fort. Notice the sign “Toga” . In Fijians pronounce it “Tonga” but it is not spelled that way. It was quite some distance up the mountain; overlooking the river valley; the salad bowl of Fiji. 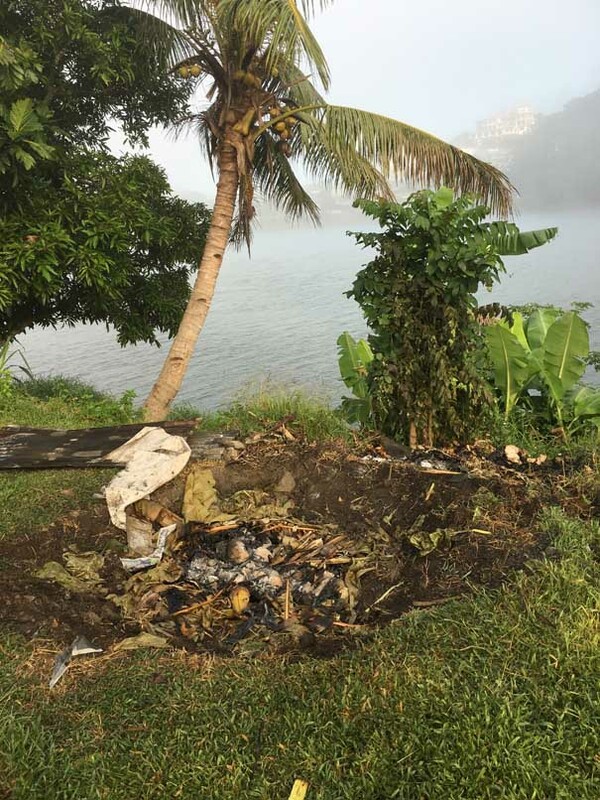 We again found more pottery shards and the community where the earliest Fijian settlers had lived. Oddly enough, all the paths were strewn with clam shells. The river is full of tasty clams and the archeologist surmised that the clam shells were spread around the village so no one could sneak up on the residents and surprise them. A fascinating method to ensure safety. 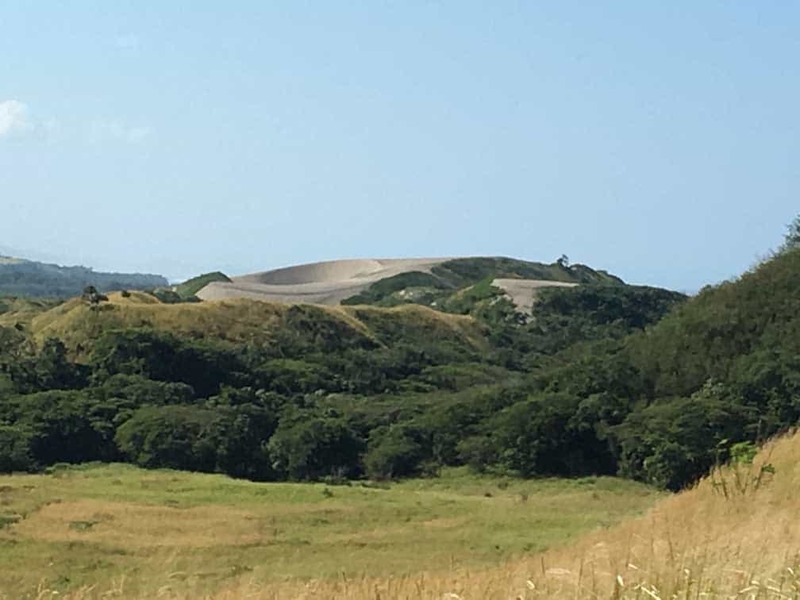 From here we visited Sigatoka; one of the larger towns in Fiji and home of the winningest public soccer team; at least that is what were were told. W/ picked up fresh food in the market, I added data on our phone and the rest of the trip was a quick ride back to Vuda Marina. Again pronounced Vunda Marina. Tired, all of us went to our various homes; oops boats. We began again to schedule our projects so we might be able to leave the marina some day and swing to the breeze!